We developed a flyer that showcases our four pathways to obtain agricultural degrees in Illinois. We want to encourage students to compare the different experiences and explore the benefits of each program. Much of our future workforce in agriculture is leaving the state to go to college, which signs their permission slip to stay out of state permanently. We need to unite to fix this problem. 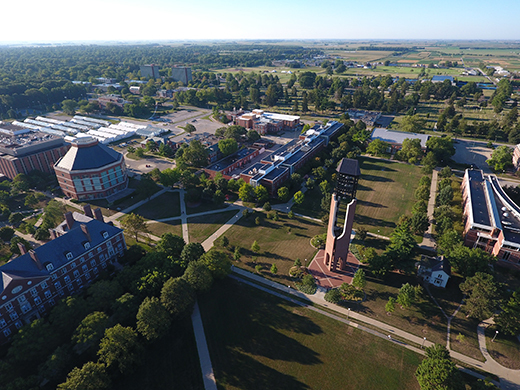 I truly believe that we can compete with any of the agricultural colleges in the Midwest if we have a chance to get students on campus to hear our story and imagine themselves as a student here. We are different than SIU, ISU, and WIU. But there’s no doubt that these schools offer valuable opportunities that may be the right fit for potential students. Personally, the University of Illinois was the best fit for me. I have no regrets about my college choice – it has served me well and opened doors to opportunities that I never dreamed were possible as a high school student. Some people have questioned why we would encourage Illinois youth to consider another school in state. My answer to this is simple. When we compete with each other, we simply drive more people out of state. This approach isn’t working very well for us and I believe standing together will make people at least a little more curious to explore our in-state options. At the end of the day, I sincerely hope students will choose to further their education in Illinois. If you want to pursue a future in agriculture, look at all of the resources Illinois offers. From Chicago to the Dixon Springs Agricultural Research Center, the opportunities for students to explore career paths and gain hands-on experience are endless. We need your help to share this message far and wide in Illinois as we all seek to make tomorrow a better place for everyone. We are hopeful and optimistic about what we can do together to build our state’s workforce and economy through talented, driven, well-prepared college graduates.